The Layla 49 inch vanity combo presents a sleek and attention-grabbing profile that will make your bathroom "The Room" in your home. A pristine white finish and dazzling blue glass hardware please the eye while the solid wood frame, dovetail joint construction, and soft-close glides and hinges testify to quality craftsmanship. Layla's uncluttered panels allow the beauty of its design and construction to shine through, and the combo comes with a black granite top and oval undermount sink. A matching mirror and linen tower allow you to create a complete design palette. Let Layla bring your bathroom to life. The Austen 73 inch vanity combo is simple yet stunning. The Austen Collection features a minimalist design that pops with color thanks to the refined Twilight Gray finish with matte gold trim and hardware. The vanity combo features a solid wood birch frame, plywood drawer boxes, dovetail joints, a toe kick for convenience, soft-close glides and hinges, white quartz top and dual rectangular undermount sinks. Complete the look with matching mirror, mirror cabinet, and linen tower. A perfect choice for the modern bathroom, Austen feels at home in multiple design settings. Style. Function. Versatility. The 37-inch Brooks vanity combo will be the cornerstone of your bathroom, providing ample storage space in a compact design. Featuring a chilled gray finish and clean lines, the Brooks embraces a transitional aesthetic that is timeless and pure. The combo includes a durable black granite top and oval white vitreous china sink. Classical in style, the Thompson 37-inch combo boasts a timeless appeal that will enhance the beauty of any bathroom. Tasteful detailing enriches the sophisticated aesthetic that includes the choice of either a Charcoal Glaze or French White finish. A solid wood frame, dovetail construction and Black Bronze hardware speak to the quality craftsmanship of this collection. The combo includes a durable carrera white marble top and oval white vitreous china sink. 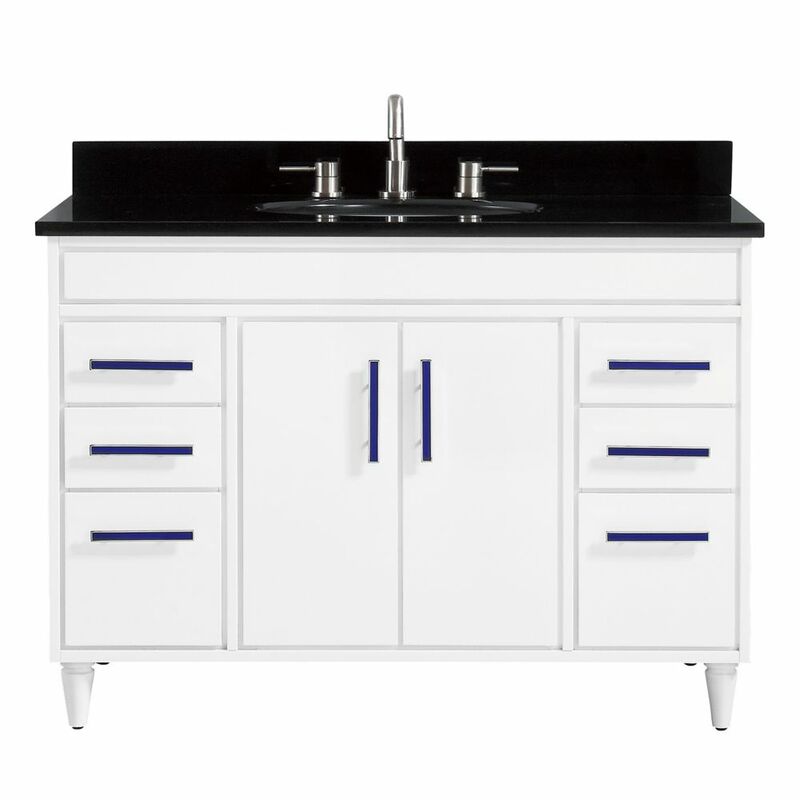 Layla 49 inch Vanity Combo in White with Black Granite Top The Layla 49 inch vanity combo presents a sleek and attention-grabbing profile that will make your bathroom "The Room" in your home. A pristine white finish and dazzling blue glass hardware please the eye while the solid wood frame, dovetail joint construction, and soft-close glides and hinges testify to quality craftsmanship. Layla's uncluttered panels allow the beauty of its design and construction to shine through, and the combo comes with a black granite top and oval undermount sink. A matching mirror and linen tower allow you to create a complete design palette. Let Layla bring your bathroom to life.